I have been doing a daily radio talk show for 18-years. I started out, totally by accident, doing a financial talk show on a business radio station in early 2000 as the “dot.com” crash was underway. It was the genesis of what would eventually become Real Investment Advice.com Then, in 2007, I got picked up by a larger radio station in Houston, Texas to do my own radio program and was eventually asked to expand the show to cover conservative politics. As a “fiscal conservative,” discussing the intersection of political and fiscal policies as it relates to the economy, financial markets, and our families was an easy transition. As the “financial crisis” ensued our commentary regarding capital preservation and risk management brought on a larger audience. During the next 8-years under the Obama Administration, I openly disagreed with policies like the Affordable Care Act, IRS suppression of conservative groups, and unbridled spending and debt expansion in Government. I didn’t disagree with these policies because they were from an opposing party, but because they weren’t good for the country, the economy, or our families. Importantly, my show allowed for open and honest discussions by those on both sides of the argument. While we certainly had our share of “heated” debates, they were always civil, respectful and honest. We discussed facts, exposed fallacies, and shared beliefs in an educational format. However, over the last two years, having those open and honest discussions are no longer viable. The “heated”exchanges are now simply vitriolic. There is no ability to “simply disagree” with those on the “right” or the “left” as debates are have devolved into yelling matches. The hypocrisy of both sides has become acidic. During the Obama Administration, the “right” consistently droned on about the flaws in the U-3 unemployment rate. Now, they use it as proof that Trump’s policies are working. The “left”is just as bad in switching arguments to support their narrative as well. Just as in any marriage, when two people are no longer “talking,” the end is near. 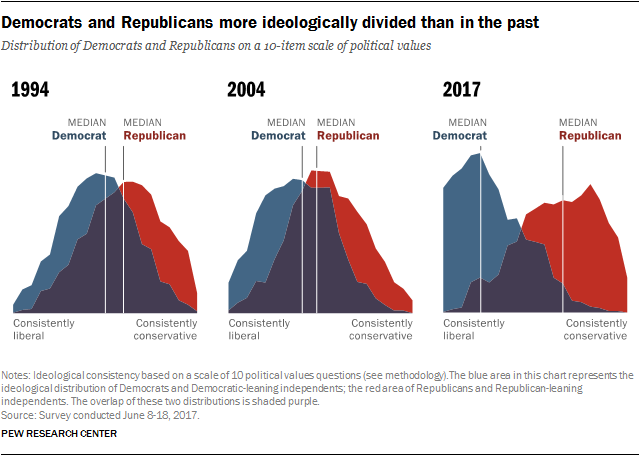 A recent PEW study shows the political divide that engulfed our country. “Has all this happened before? Sure. Time to dust off your copy of Gibbon’s Decline and Fall. Time to reread Will and Ariel Durant. Just be forewarned, the widening gyre can go on for a loooong time, particularly in the case of a major empire like Rome or America. It took the Romans about four centuries to officially exhaust themselves, at least in the West, with a few headfakes of resurgence along the way. Four centuries of mostly ridiculousness. Four centuries of profitable revenge and costly gratitude. Four centuries of a competitive equilibrium in a competitive game. We are currently on a path that can not end well. We are no longer talking. Yesterday, was the end of my “political” talk show. I am returning to my roots beginning September 4th to help prepare you for the coming crash. It is not a bearish view. It’s not a “doom and gloom” forecast. It is just the simple the reality we are on a collision course in this country which won’t be stopped. I hope you will tune in and listen.